It's finally here, the Realms and Rebels box set! After months of planning, writing and marketing, it feels a little surreal that the book is now waiting for me on my ereader. Twenty-two stories are ready to be read, full of dragons, vampires and even hellhounds! Our main aim, besides making readers such as yourselves very happy, is becoming a USA Today bestselling box set. To do that, we need to get a certain amounts of sales not only on Amazon, but also on iTunes, Nook and Kobo. So, if you want to support us, please get yourself a copy - the price will go up soon. We'll be celebrating all week on Facebook, so be sure to join our official Party Room! ​The story I've got in this box set is Hell's Calling, co-written with the lovely Bea Paige (check out her books! She's amazing!). It's a retelling of Dante's Inferno, except that our heroine isn't a lovesick old poet, but a sassy young woman who will do anything to rescue her little sister from the depths of hell. On the way, she meets an angel, a hellhound and a werewolf, all of which have been incredibly fun to write. 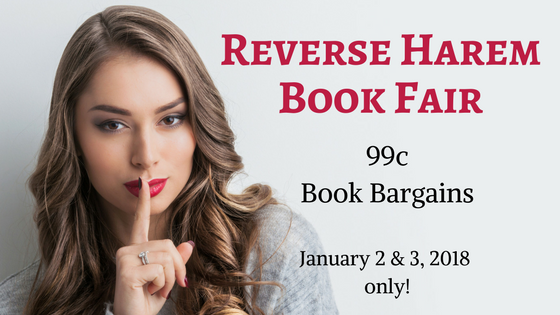 Our reverse harem book fair features some of the best paranormal romance reads around. Join these leading ladies and their cohorts as they take you on a ride filled with heart-stopping action, thrilling mysteries and steamy romance. These 99c reads will carry you away to worlds of dragons, wolves, shifters, vampires, sirens and more!